Cars and surfboards are far from the only ways to get around San Diego. The region has as bevy of public and private transportation options. More than just a way to get from Point A to Point B, these transit options are some of the best ways to get a feel for the city, check out the region’s landscape, or have a bit of fun. The Trolley is a light rail system consisting of 55 stations over 53 miles. The three lines—Green, Orange, and Blue—connect downtown with areas to the east and south. It’s a terrific way to get to or from downtown, Old Town, Mission Valley, or the airport (with a short bus connection) to outlying communities of Chula Vista, El Cajon, National City, and Santee. You have heard of the dockless bicycles and electric scooters that have reinvented how people are commuting around cities like New York, San Francisco, and Los Angeles. San Diego is very much a part of that modern trend, with thousands of brightly colored dockless bikes and electric scooters waiting to go for a spin. Just find one on the sidewalk, download the corresponding app, and start cruising! Please note: riders are required to be 16 years of age or older, must wear a helmet, and obey all traffic laws when aboard an e-scooter. Please refer to each service provider for other rules and regulations. The City of San Diego provides a free shuttle around Balboa Park, hitting numerous stops a short walk from the park’s many attractions. The green trams—either enclosed buses or open-air trolleys—run from 9:00 AM to 6:00 PM November through May and until 8:00 PM June through October. The trams can be picked up at Tram Central near Inspiration Point every eight to 10 minutes. Apart from the Coronado Bridge, the only way to reach Coronado Island is by way of public water taxis crisscrossing the bay between downtown and Coronado Ferry Landing. Grab a boat at the Broadway Pier or Convention Center on the downtown waterfront and enjoy the gorgeous scenery on the 15-minute passage. The Coaster train gives you access—and prime views—to the entire San Diego County coastline. 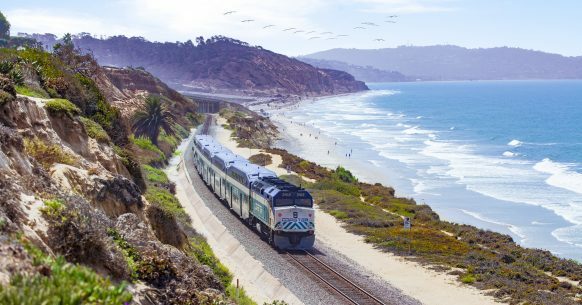 The commuter trains link eight stations between downtown San Diego and Oceanside, passing through Old Town, Sorrento Valley, Solana Beach, Encinitas, and Carlsbad. Twenty trains run on weekdays and even more on weekends, making for a super convenient schedule of departure times from before sunrise until late in the evening all year long. This entry was posted in Insider Tips and tagged county, entertainment by San Diego Magazine. Bookmark the permalink.